When most parents plan out their kids’ school lunch, they try to find ways to put together a healthy lunch that contains foods that their kids love. If your kids are picky eaters, this task can get pretty difficult. If you need help putting together some tasty lunches for your little ones, we’ve gathered some great healthy lunch ideas that even the fussiest eaters will like. The next time you get stuck trying to figure out what to make your kids for lunch, try one of these easy dishes. 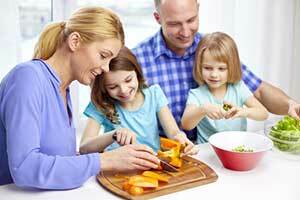 Make your kids their own healthy version of Lunchables by creating build-your-own meal kits. If your kids are big pizza fans, put together a build-your-own meal kit that features a whole wheat tortilla, pizza sauce, low-fat cheese, and some veggies and pepperonis to use as toppings. Or, if they enjoy tacos, you can give them a kit that includes taco shells, meat, cheese, salsa, tomatoes, and lettuce. You could also create build-your-own meal kits that include a variety of healthy salad ingredients. Your kids will love getting to make their own individual pizza, salad, or tacos. Another great healthy lunch idea is a tortilla roll-up. Whole grain tortillas are tasty and healthy alternatives to bread. You can add a wide variety of ingredients to your tortillas, but just be sure to go light on the higher fat items. Fill most of the tortilla with veggies and protein-rich items, and simply spread on a little mayonnaise and sprinkle on a bit of cheese. If your kids are turkey fans, try making them a turkey and cheese tortilla roll-up. Layer turkey, cucumbers, lettuce and mozzarella cheese on top of a tortilla. You can also add a light layer of mustard or mayo, depending on what condiment your kids’ like. Wrap the tortilla up, and it will be all ready to go into their lunchbox. You can also make sweet and healthy tortilla roll-ups for your little ones. Spread almond butter on a tortilla, and add some strawberries, bananas, and blueberries. You can also use peanut butter if your kids don’t like almond butter. Looking for a way to spice up a plain old sandwich? Make your kids sandwich kabobs. To make these kabobs, first cut two small squares out of a piece of whole-wheat bread. Then, roll up pieces of your kids’ favorite deli meats. Grab a handful of cherry tomatoes, and slice up lettuce and cheese. To assemble the kabob, start by skewering on one of your bread squares. Add on the cheese, vegetables, and deli meat. Finish by skewering on your other bread square. You can also include a dipping sauce with the kabob, like mustard or low-fat dressing. If you’re searching for a healthy side dish for your kids’ lunch, try making them a fruit salad that utilizes all the colors of the rainbow. Slice up a combination of strawberries, kiwis, oranges, grapes, pineapples, bananas, and blueberries. Feel free to add or omit ingredients based on your kids’ preferences. For some added sweetness, drizzle on a dressing made of honey, lime zest, and lime juice. Your kids will enjoy showing off their brightly colored dish to their friends, and they’ll also love how sweet it tastes. Savory muffins are a fun and unique healthy lunch idea. If your kids like ham, make them ham, cheese, and spinach muffins. To make this delicious recipe, mix together two cups of flour, two cups of grated cheese, two eggs, a cup and a half of milk, half a cup of ham, and a handful of spinach. Once it’s all mixed, bake the muffins for about twenty-five minutes at 350 degrees Fahrenheit. The recipe will give you twelve tasty muffins. If your kids don’t eat meat, consider making zucchini almond muffins. To make these tasty treats, first blend six ounces of almonds in a food processor until the almonds have a flour-like consistency. Then, grate a small zucchini and combine it with the almond flour. Add in three teaspoons of agave, an egg, two tablespoons of butter, a teaspoon of vanilla, and six ounces of Greek yogurt. Mix everything together, and then transfer the batter to a muffin tin. Bake at 350 degrees for about fifteen minutes, and stick a toothpick in the muffin to ensure that it’s baked through. These zucchini muffins are only sixty calories per serving, and they’re absolutely delicious. If your kids are pasta lovers, make them a kid-friendly version of classic pasta salad. Create a colorful pasta salad that uses a variety of vegetables that your kids like. You could go Southwestern with a pasta salad that uses black beans, corn, bell peppers. Or, you can go for a simple pasta salad that uses just tomatoes, cheese, and chickpeas for protein. Experiment with a few different types of pasta salads to see which one your kids like best. A yogurt parfait side dish will add some extra protein to your kids’ lunch. It’s also easy to customize this dish with ingredients that your kids like. 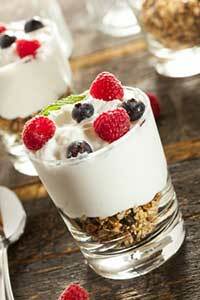 Give your kids a plain yogurt and a small container that’s filled with tasty treats that they can add into the yogurt. Place granola and a few different fruit options in this container, like blueberries, strawberries, or blackberries. You can also include a small packet of honey for some more sweetness. Once you’ve found a few healthy meals that your kids love, you’ll then have to decide how they will transport the food to school. Try using an eco-friendly lunchbox that’s free of plastic, chemicals, and BPAs. When you use these types of containers, you’ll be able to ensure that your kids’ lunchbox is just as healthy as their lunch. If you’re looking for a new, eco-friendly lunchbox, Kangovou can help you. Check out our portable and colorful kids’ dishware sets. 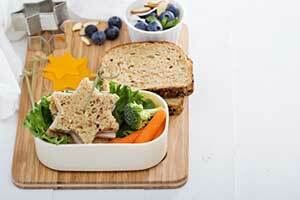 These dishware sets are the perfect containers for your kids’ healthy lunch.